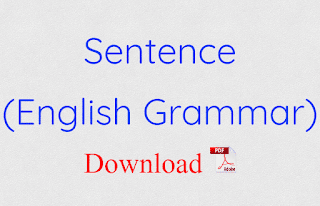 Sentence: A group of words , which makes complete Sense , is called a sentence . 1.Subject : The subject answers the question : Who ? 2.Verb : Verb tells something about subject . 3.Object : The object answers the question : What or Whom ? ( a ) She is reading a newspaper . ( b ) Ram was a great leader . ( c ) He is going to school . ( d ) Mohan is our headmaster . A. SUBJECT + VERB . ( a ) My legs are aching . ( b ) Something happened . ( c ) Birds fly . ( d ) Fire burs . B. SUBJECT + VERB + OBJECT . ( a ) I need a rest . ( b ) Five people are moving the piano . ( c ) Shyam has lost her pen. ( d ) We should help the poor. C. SUBJECT + VERB + COMPLEMENT . ( a ) This piano is heavy . ( b ) It Was a big problem . ( a ) He became a soldier . ( b ) Ram looks sad . D . SUBJECT + VERB + ADVERBIAL . ( a ) It is on my foot . ( b ) Their house is nearby . E . SUBJECT + VERB + OBJECT + OBJECT . ( a ) I lent hin my book . ( b ) Ram give Sita a present . 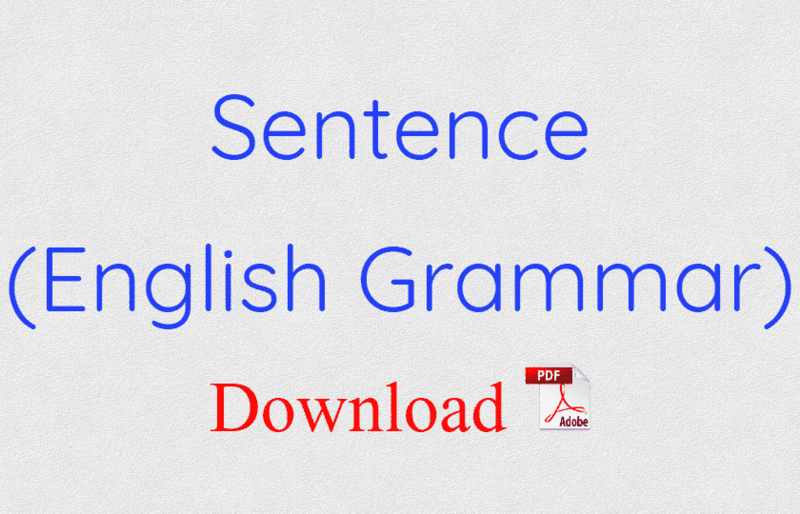 A declarative Sentence can be either positive or negative . When the statement is positive and affirms something , it is called affirmative sentence . It asserts and declares something . It starts with a capital letter and ends with a period / full stop . ( a ) I go to school . ( b ) Spring comes after winter . When the statement is negative and denies something , the sentence is called negative . The most Common Way to negate a sentence is by inserting ' not ' in the verb phrase . ( a ) I do not go to school . ( b ) Spring does not come before winter . ( a ) You should not have bothered . ( b ) This plate has not been washed . ( a ) The photos are not ready yet . ( b ) It is not very warm in here . ( a ) Music is not allowed after ten . ( b ) No music is allowed after ten . ( a ) He never comes on time . ( b ) Ram never tells a lie . A sentence that asks a question is called an interrogative sentence . It starts with a capital letter and ends with a question mark . ( a ) Ram : Do you know me ? ( b ) Mohan : Yes , I know you . ( c ) Ram : Is he your brother ? ( d ) Mohan : No , he is not my brother . Wh - questions cannot be answered with ' Yes ' or ' No ' . These start with a question word such as why , which , where , who , what etc . ( a ) Ram : What is your name ? Mohan : My name is Ram . ( b ) Ram : Who has stolen my book ? Mohan : Shyam has stolen your book . We make a question negative by putting n ' t after the auxiliary . An imperative Sentence expresses a Command , a request or an advice . It starts with a capital letter and ends with a period . The most typical and most commonly used imperatives are second person imperatives , and these do not have a subject . ( a ) Look at the map . ( b ) Work hard to pass . ( c ) Please bring me a glass of water . ( d ) Let him play . ( e ) Do not make a noise . ( a ) Do not play on the road . ( b ) Never tell a lie . ( a ) You do as you are told . ( b ) You Wash the dishes today and I’ll wash them tomorrow. ( a ) Always speak the truth . ( b ) Always show humility to the guests . ( a ) Children keep quiet . ( b ) Those who want to go to the exhibition stand aside . ( a ) Do sit down . ( b ) Do let 's have tea now . ( a ) Let me go , please . ( b ) Let's get the work done . ( c ) Let's go out for a walk . An exclamatory sentence expresses a sudden strong feeling of joy , Sorrow , Wonder or Anger etc . It starts with a capital letter and ends with an exclamation mark . ( a ) Hurrah ! I have stood first . ( b ) What a beautiful stroke it was ! ( c ) How pretty she looks in this dress ! ( d ) How fast he drives ! ( a ) What a shame ! ( b ) What a pleasant day ! ( a ) May God bless him with a son ! ( b ) Long live our nation ! May + Pronoun ' you ' + Verb + ! ( a ) May you live long ! ( b ) May you succeed in the examination ! ( a ) I wish I were a bird ! ( b ) I wish I were a millionaire ! ( a ) Would that my brother were alive ! ( b ) Would that I not wasted my money !